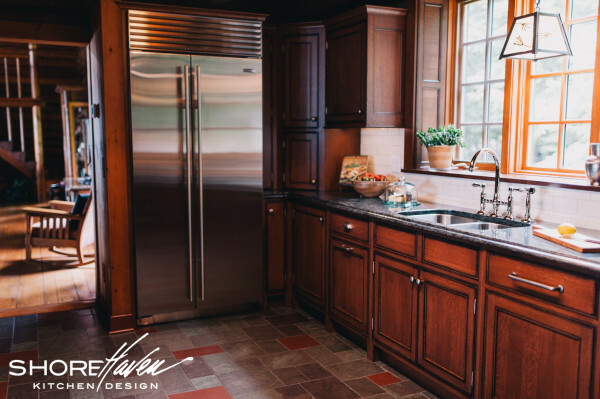 When we were approached to renovate the kitchen of an eighty year old log cabin nestled into the shoreline of Lake George, we knew it was going to be a special project. Charged with the task of redesigning the space to meet today’s modern kitchen technologies, we also wanted to respect the home’s idyllic location and interior charm. Log cabins have a uniqueness all their own. The logs create an inviting atmosphere. Wood’s natural tones and textures add depth to a home’s rustic and cozy appeal. However, they can also be dark. Wall to ceiling logs have a heaviness about them that can be difficult to balance with light. So here was our task. 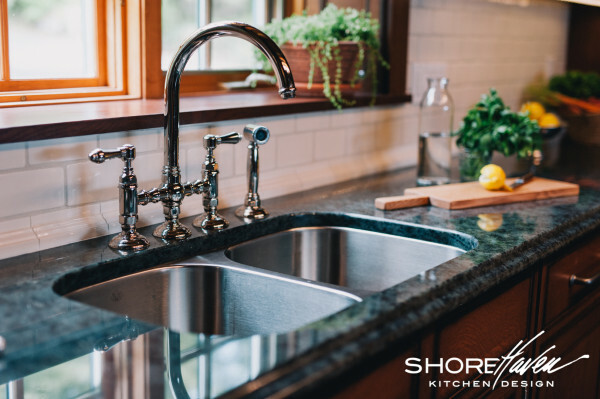 Remove the existing kitchen (which had been remodeled in the late 1980’s), update everything, plumbing, electrical, even the floor, and make this a gourmet kitchen fit for today’s modern chef. 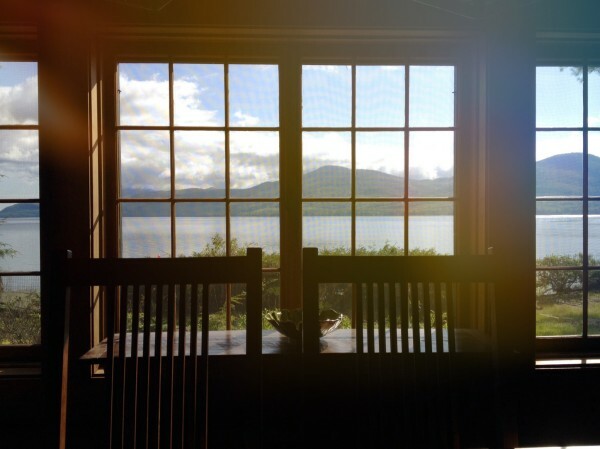 View from the dining table, overlooking Lake George. And so the project naturally took shape. 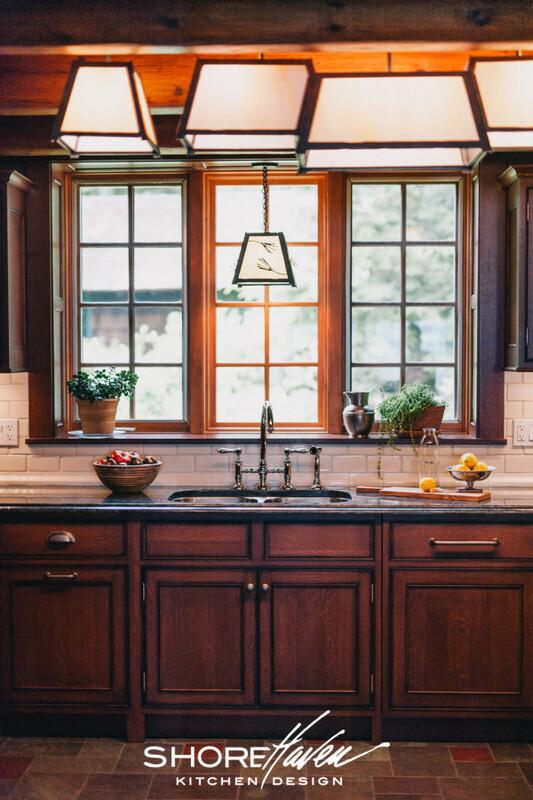 To better transition from outside in, the wood floors were removed in the kitchen and local slate tiles from Sheldon Slate, in Granville, New York, were laid in a traditional pattern. 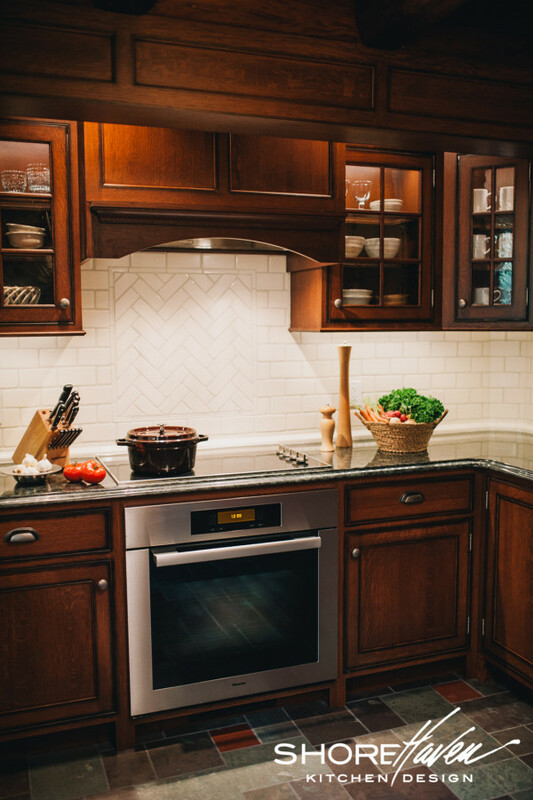 We chose quarter sawn white oak for the cabinetry by Crystal Cabinets, in a traditional beaded inset style, with pewter barrel hinges; a style similar to what once might have been there eighty years before. 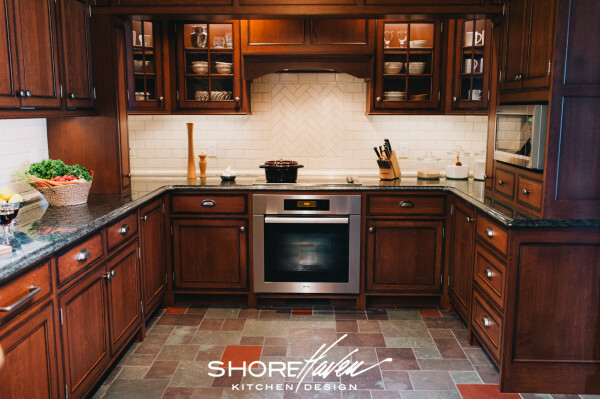 Quarter sawn white oak cabinetry and mottled purple and red slate tile floor. 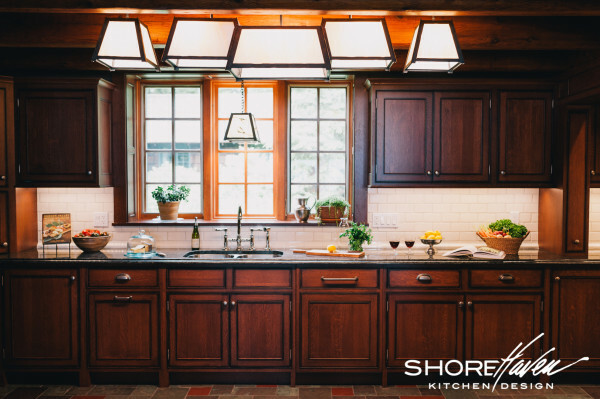 To bring light to the room and balance the antique finished cabinetry, custom light fixtures were made by local artisan, Chicken Coop Forge in Queensbury, New York. The centerpiece of the room, the five-piece fixture protrudes below the ceiling logs, so light remains unobstructed. Five piece center light and pendant by Chicken Coop Forge. The white craftsman tile backsplash (the handmade sister to the subway tile) adds another dimension of light reflectivity. The tiles, hand cut in Rock City Falls, outside of Saratoga Springs, are from L’Esperance Tile Works. These tiles are beautiful. Yes, they are simple, but up close, they have an elegance in their detail. Framed herringbone tile detail above cooktop. Finally, the counters. Local Mountain Green granite, quarried in the Northern Adirondack Mountains. Flecks of ruby garnet scatter across the jeweled greens of the polished counter’s surface. Mountain Green granite with ogee edge detail. We are very fortunate to live in an area with such talent and resources. Although not always possible, the opportunities to work with local artisans, fabricators and craftspeople is one of the most rewarding work experiences you can have in this industry. 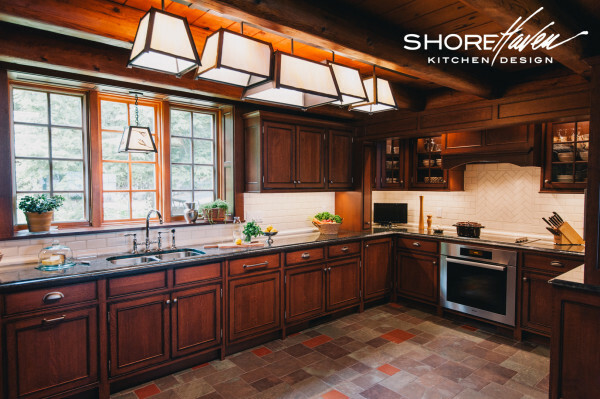 This Lake George log cabin kitchen was a pleasure to work on—and the people, a pleasure to work with. Stainless steel Sub Zero refrigerator adds a professional element to the kitchen. Miele cooktop and oven have plenty of surrounding counter space for meal preparation. Italian-made Rohl bridge faucet beneath mullioned windows.